All transactions are safe and secure with a reliable history in online purchasing behind each of our associates. Buy the Beauty and the Beast Stained Glass T-Shirt to own Beauty and the Beast clothing and merchandise. 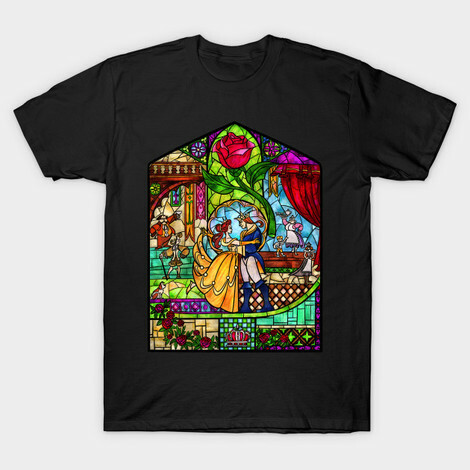 This clothing item titled "Tale as Old as Time" is an artist's interpretation of the Beauty and the Beast happily-ever-after stained glass that appears at the end of the movie. It features a variety of well-known elements from the Disney movies, including Belle, Prince Adam, Cogsworth, Chip, and the iconic rose that is at the center of the story. This stained glass shirt allows you to celebrate your favorite aspects of the movie in one design. In addition to the Beauty and the Beast Stained Glass T-Shirt above, browse the Beauty and the Beast Clothing Gallery for more apparel like men's and women's clothes, kids shirts or hoodies.